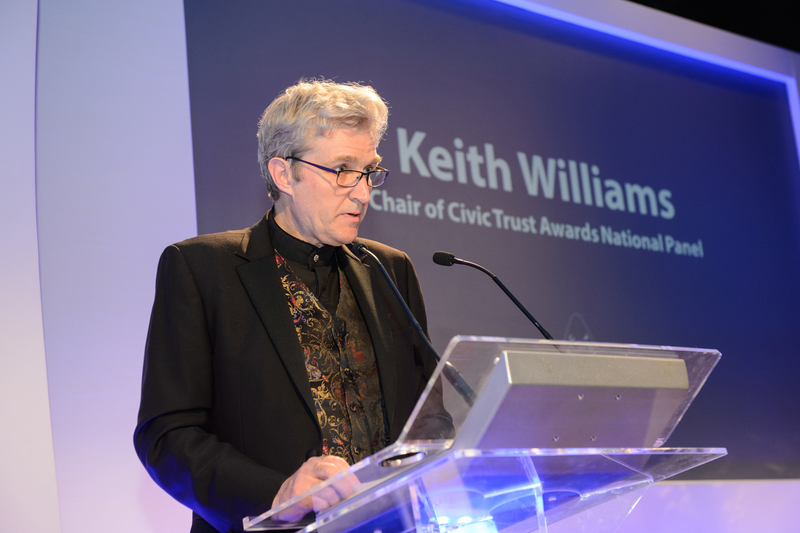 Friday 10th March 2017 : Keith Williams delivered the chairman’s address to a sold out event at the 58th Civic Trust Awards Dinner at the Guildhall in Winchester. Deputy Mayor Elect David McLean of hosts Winchester City Council welcomed all to the city. For the 2017 round of the Civic Trust Awards, 247 entries were received primarily from the UK but also from Canada, China, Denmark, Italy, Kenya, Qatar, the Republic of Ireland and Russia, reflecting the awards’ broad geographic reach. Of the schemes submitted, 108 were referred to the National Panel for consideration as potential award or commendation winners. The National Panel, 12 in number, includes architects, urban designers, people from government, developers and commissioning clients, planners, accessibility consultants, sustainability specialists, and architectural journalists, reflecting the diverse range of interests concerned with architecture and the built environment. 19 Civic Trust awards were awarded together with 26 Commendations and 5 Special Awards, whilst 1 award and 6 Commendations were made by the Conservation Panel. Keith presented the final award of the evening, the National Panel Special Award (CTA’s top award) to the team from John McAslan and Partners for the Sacred Heart Cathedral of Kericho in Kenya.